Even though I'm a huge Shirley Chisholm admirer, I didn't even realize this 2004 documentary existed until it was recommended to me on Netflix. I immediately moved it to the top of my queue, it came yesterday, and I watched it last night. "Over 75% of our budget is being spent to continue an immoral war in Vietnam, and yet we have a domestic war here at home in terms of the crises in our cities. There's something wrong with our nation." It was amazing to watch and think about the ways in which we have progressed in terms of anti-sexism and anti-racism, as well as the ways in which we still have a very long way to go. It was directed by the amazing Shola Lynch (read/watch a fabulous interview with her about the film here) and featured interviews with Susan Brownmiller and Octavia Butler, as well as archive footage of Betty Friedan, Gloria Steinem, and other prominent feminists. 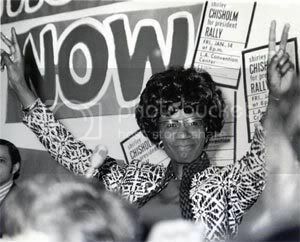 Not only that, but we are so fortunate that the film contains interview footage with Chisholm herself, taken before her death on January 1, 2005. She was eighty years old when she died. It isn't mentioned in the film, but Chisholm is also well-known as a huge proponent of reproductive rights, and I hear she covered this topic in depth in her 1970 autobiography, also called Unbought and Unbossed, (which is sadly out of print, but check your library) if you want to know more. "This is what it comes down to: artificial distinctions between persons must be wiped out of the law. Legal discrimination between the sexes is, in almost every instance, founded on outmoded views of society and the pre-scientific beliefs about psychology and physiology. It is time to sweep away these relics of the past and set further generations free of them." Can you imagine how the world might be different today if we had elected her (instead of Richard Nixon) in 1972?